Spring is certainly on its way (if you ignore the gale force winds we have been having!) and it fills me with joy to leave the coldness of winter behind and step out into some nicer weather. It always helps with children when you can get outdoors more, even just for a little bit each day. 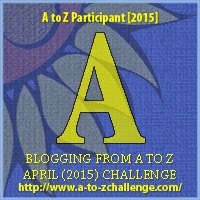 So this year I have signed up to the A to Z challenge and I wanted to make my posts child focussed! My blog has two aspects really – my Christian faith and how that plays out in my current world, and also my role as a mother. The last 40 days have been devoted to the amazing 40 acts challenge and exploring how I can be more generous as a Christian, and as that draws to close I thought it would be fun to do something a bit less serious!! Stopping by on the way through the A to Z Challenge. This has been a bad winter so its wonderful to finally get some nice temperatures. Yay to spring! Looking forward to reading about your experiences as a mom all April! Thanks for the comment Sangita – I will make sure to visit your blog too. I join in the chorus of "yay to spring!"